The Governor, as the Commander in Chief of the Regiment, has appointed Warrant Officer Class 2 (WO2) Gavin Rayner as the Regiment’s new Regimental Sergeant Major (RSM). Now a Warrant Officer Class One (WO1) Rayner takes the position as the unit’s senior enlisted man following the retirement of WO1Gavin Lee. Mr Lee preceded his service to the Regiment with his involvement in Junior Leaders where he and Mr Rayner first met and became friends. Although Mr Lee has served in many posts in the Regiment during his 18 year career, members of the public will probably know him best for his participation in public parades. Highlights include the Presentation of New Colours in 2010 and the visit by HM The Queen and HRH Prince Phillip as the apogee of the 400th Anniversary celebrations. 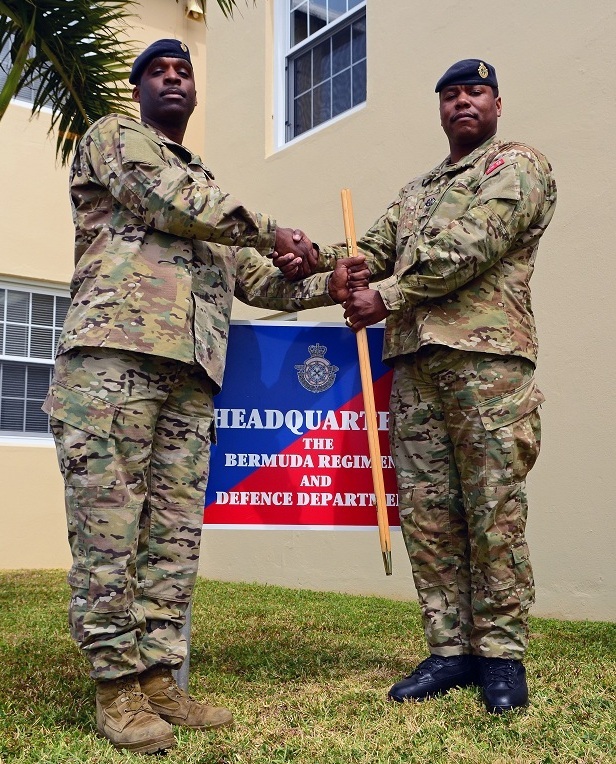 During his service he has represented Bermuda on attachments to the Royal Anglian Regiment, the Royal Gibraltar Regiment, and served for seven months in Sierra Leone as part of the International Military Advisory Training Team. WO1 Rayner enlisted in 1994 and spent his first years of service balancing his civilian career as a culinary specialist with his military career. However, in 1997 the then Corporal Rayner was taken onto full time staff and began a steady career towards his current post as the RSM. Mr Rayner has a career serving in all fields including skill at arms, Adventure Training / Outdoor Field Skills, logistics, and training. His ability was noticed by his commanders and was selected to serve with the 1st Battalion of the Royal Anglian Regiment during their Exercise Grand Prix (Kenya) in 1998. WO1 Rayner moved to the UK in 2008, and was posted to the 1st Battalion of the Royal Anglian Regiment, serving in their Training Wing as the Weapon’s Warrant Officer. During his two year service with the Vikings (the 1st Battalion’s nickname) he also assumed posts as the Platoon Commander of Minden Platoon and the Operations Warrant Officer. Upon returning to Bermuda WO1 Rayner spent most of the following year in the Quartermaster’s Company, initially as the Company’s Sergeant Major and then promoted to the Regimental Quartermaster Sergeant (RQMS). However, his time as RQMS was shorter than anticipated when he was identified last month as the designated RSM. When asked about WO1 Rayner’s promotion, Commanding Officer of the Regiment, Lieutenant Colonel Gonsalves said, “Mr Rayner has a depth of knowledge and experience, and the Regiment will be the direct beneficiary of his skills. Why is the whole of the regiment wearing combat dress? why are the PERMANENT staff not in working dress? are we in a state of emergency? Bring back some CLASS! someone always messes with a good post…..the only thing permanent about the Regiment is what it stands for whether you think it bad or good……..the clothes don’t denote a lack of class….those two guys surely aren’t defined by their uniform are they? very shallow….you must equate what a man wears to his performance, eh? Maybe ‘cos the Regiment like every other GOVT Dept has had to do more with less? Can we just focus on the sentiment of the story and the promotion of a Bermudian to a respected and needed position? When you find some class Cleancut be sure to keep some for yourself.